Aspire facilitates arts & spirituality outreach at Emmanuel. Through musical events, art shows, lectures and presentations on the humanities, we celebrate the many gifts of our church and the greater Rockford community. 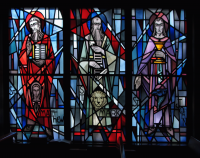 The stained glass windows at Emmanuel feature scriptures and saints. They were created by Conrad Schmitt Studios of Milwaukee.